The new Pope Francis comes from Latin America and has an understanding of the true depths of poverty that is not that common in the United States and Western Europe. Outside the very Western urban part of downtown Buenos Aires lie the barrios and the shanties of the Argentinian poor. Life is more transient in neighborhoods where there is a lack of water, food and opportunity, and where sanitation is a sometime thing. Government programs do not extend far enough, or help many at the bottom of the ladder and government statistics seem to hide much of the problem. This holds true in many parts of the world. I was struck, at the time of my first visit to China in 1987 by the contrast between the opulence of the walled community in which the “Western” hotels were located in Shanghai and the desperate poverty of the communities just the other side of that wall. Move forward some fifteen years and the cities of China are much different, across much of the landscape. It is a transition that has been effected through large-scale industrialization and the vast quantities of power that is expended in the growth and continuation of that industry. Such a transition is the vision for many countries in the world, but the role of power in that change, and the increasing costs that it imposes, must be recognized. Just having a nominal power available is not, in itself, enough. Consider the case that India, a potential challenger to the Chinese in the market place, now finds itself in. As with China the country has desperate poverty, but it also has a developing industrial base that is driving change. But the rate of that change has, for some time, been limited by the amount of power available. Power cuts in India are so commonplace that the Times of India recently ran an article detailing some things to do during these “incessant” cuts. And while it is only the major blackouts, such as the power failures at the end of last July that garner global headlines because of the scale, some 600 million people being without power in that event, it is the daily, smaller scale events that are making it increasingly difficult to run a business. In Coimbatore, for example, a city of some 3.5 million people, power outages can last up to 14 hours a day, and “load-shedding”, where power outages are rotated around the neighborhoods is an accepted part of daily life in the country. The ubiquity of these cuts mean that many folk have purchased stand-by generators, which in turn drives up the demand for fuel. But it is difficult to run a business – whether it be a factory or a restaurant, if you don’t have a reliable source of power. And if cuts are frequent enough, and the alternative power costs are too high, then business either closes or moves somewhere else. It is such a decision that is apparently facing small business owners in places such as Coimbatore, but it has the potential to spread to the larger, and now more dependant communities such as Bangalore, the third largest city in the nation, and the Silicon Valley of India. This is one of the drivers, expanded to a national scale, that is facing India as it decides what to do over sanctions on Iranian oil. Earlier in that debate India switched out of paying for the oil with US dollars to paying in gold. Given the volumes involved, India imported around 285 kbd from Iran in January, this does nice things (if you are a gold miner) for the price of gold, in dollars. But that can only go so far, and there are suggestions that the payments are becoming more about barter. As a result India has become Iran’s top customer and it is a difficult relationship to change, since some of the Indian refineries are designed only to take Iranian crude. However, as sanctions are growing to include insurance companies, Indian refineries that process the Iranian crude are threatened with the loss of coverage. Whether this will force a change in source of supply, or whether the Indian Government will find a way around the dilemma is an ongoing debate, complicated by the “good deal” that India is getting as a price. 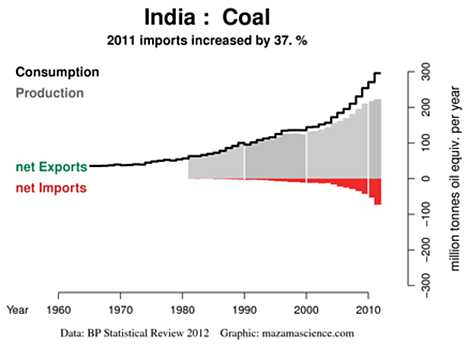 The other fuel on which India is critically dependent is coal. And although the country has large reserves of coal, it is not developing them fast enough to meet demand, and thus must increasingly import both thermal and metallurgical coal. 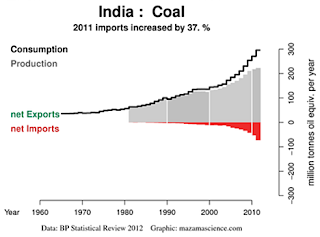 By 2017 imports are anticipated to rise to some 266 million tons of coal, in total. And while much of the press has focused on the Chinese development of new coal-fired power plants, India is planning some 455 new plants, while China has only 363 on the books. This comprises the majority of the 1200 plants currently being planned around the world. Apart from challenging the opinions of those who suggest that coal demand has, or will soon peak, this speaks to the burgeoning need for fuel sources as nations struggle to bring their poor into a better standard of living. It may well be a debate that now acquires a religious overtone. Thank you for writing this article, Bittooth. It is a very important message -- one which has been overlooked by too many spoiled Western "Granolas", who kid themselves that their bicycles and their unreliable bird-killing wind factories are making a difference. The reality is that about 2 billion human beings are currently under-served by energy. No amount of "Greenie" conservation is going to help those people; no amount of unreliably intermittent so-called "renewable" energy is going to enable those people to live lifes of dignity with clean water, sanitation, and safe food. Our fellow human beings need more power. Practically, that additional power can only come from fossil fuels (coal, fracked gas) and from nuclear power plants. It is time for us in the West to cast aside deluded environmentalists and start to help our fellow man. eToro is the best forex trading platform for new and professional traders.